Despite the stronger than expected headline jobs print, which allayed fears over the unexpectedly poor February number, there was pervasive weakness everywhere. While we previously discussed the disappointing hourly earnings print, a closer look behind the headlines in today's jobs report suggests that there may have been some political "massaging" to goalseek a goldilocks number. 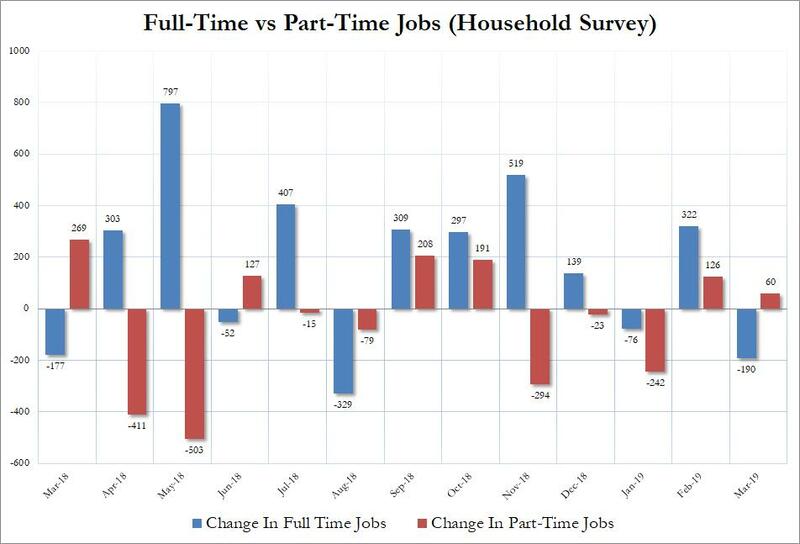 First, the Household Survey showed that the number of employed workers actually declined by 201K to 156.748K. 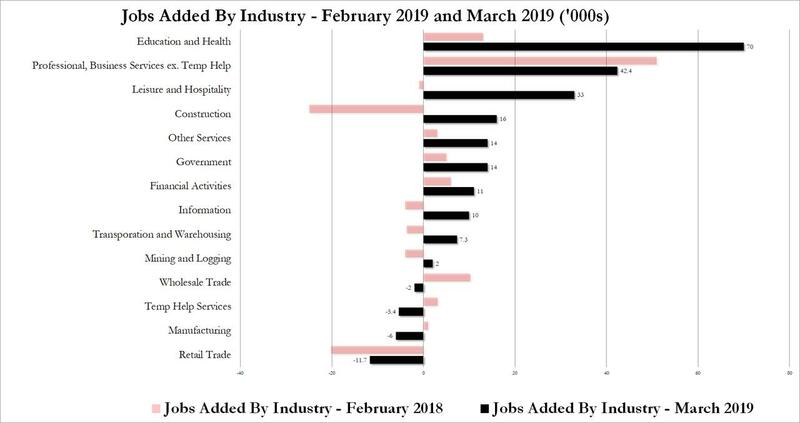 Then, looking at the composition of the jobs report shows that the March jump was entirely due to part-time workers, which rose by 60K, while full-time workers dropped by 190K, the biggest monthly decline since August 2018. What about the establishment survey? Well, while the headline number was indeed impressive, staging a major rebound from 33K to 196K, more than a third of this surge was due to low-wage Education and Health workers, which surged by 70K, while Leisure and Hospitality (i.e., hotel workers as well as waiters and bartenders, surged by 33K, with these two categories responsible for more than half the gains. Why is this notable? Because Q1 Construction and Manufacturing payrolls were the weakest since 2016. 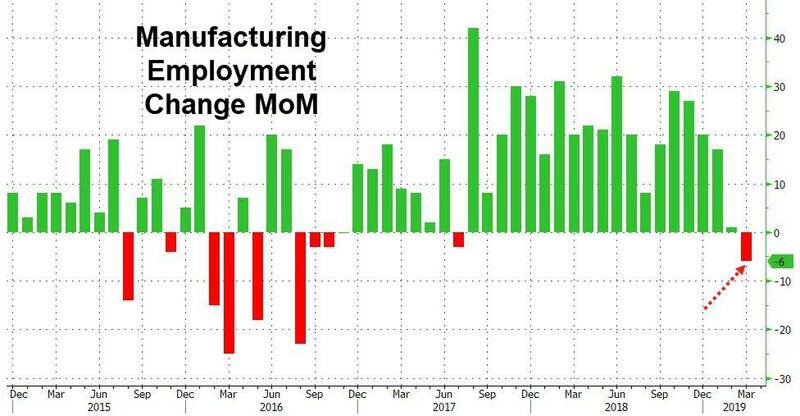 Furthermore, March was the worst month for manufacturing since August 2016. Today's report confirmed the crushing influence of Amazon as the retail workforce is now the smallest it has been since March 2016, and shrinking still. Next, Small Business seems to be pausing: as Southbay notes, small businesses were hit in 1Q by the government shutdown and then bad weather. Signs of continuing problems are reflected in the weak demand for temp support. This could be a timing thing - bad weather heading into the survey period may have played a factor. If this figure does not rebound in April, then we have an indication of underlying economic weakness.